THE GALAXY EXPRESS: Steampunk Articles and Free Reads! Steampunk Articles and Free Reads! 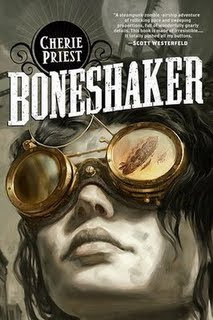 Isn’t the cover of Cherie Priest’s BONESHAKER just phenomenal? Look for it in September 2009 (excerpt here). Looking to glom a trunk-full of steampunk stories? The Mad Hatter’s Bookshelf and Book Review site offers So Much Steampunk, So Little Time. And there’s more…full steam ahead! Ciar Cullen wants to know…Are you writing a Steampunk? Check out the comment section for authors who have written or who are working on steampunk projects. Realms of the Raven breaks it down in Punk me this! Writing a “punk” genre…. Authors, Quartet Press actually lists “steampunk” in their submission guidelines! And in case you missed it, here’s a link to my earlier Steampunk Romance Watch.